Adding solar power in Alberta isn’t as simple as mounting some panels on the side of a building and then tapping into the grid. 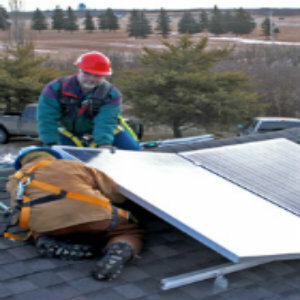 A number of other factors come into play, enough of them that they can discourage prospective solar power customers. They can include different rate schedules and incentive programs that different utilities and jurisdictions offer, as well as such factors as future electricity costs, inflation rates, business depreciation and more. To help consumers sort through the regulatory muddle, Rob Baron has come up with an online application that analyzes solar photo-voltaic system economics that he hopes to have available in February. Baron is the head of the Renewable Energy and Conservation program at Lakeland College in Vermilion, Alberta. “I think for some people the viability of a solar project depends on very individual situations,” Baron says. Baron says that putting solar on a house is essentially the same as pre-purchasing 20 or 30 years of electricity at a fixed, known cost in today’s dollars. But that makes many people nervous as they don’t know if the investment is worth it; they may not remain in the same house for that length of time, so they worry they’ll lose their investment in a sale. “When it comes to evaluating a property that has solar PV, it’s a little uncertain for a lot of people whether or not they’re going to see that value,” Baron says. While energy prices are fairly consistent across the province, the cost of transmission and distribution varies for different customers in different regions across different categories, according to Baron. That’s where Baron’s cost calculator comes in. The idea is to provide individuals with the ability to identify the hidden benefits that might make a solar PV project more desirable. Baron says once people have a bit of information about the system they’re thinking of installing, they can punch in the numbers, add some variables, and figure out how the solar PV system might benefit them economically. The application will allow people to look at factors such as where they live in the province and what rate structure they work under. While Baron says others in Canada will be able to use the application, the idea was to make dealing with multiple power providers easier in Alberta. He notes that he hasn’t fully studied the regulatory power regime in other provinces yet. Something else that complicates the estimates is the price of energy doesn’t remain static. The recent drop in Alberta energy prices has caught many by surprise, Baron explains. As a result, current prices for electricity are low. While that inexpensive energy is great for consumers, the solar PV producers suffer because there’s even less willingness on the part of people to consider solar when they have cheap natural gas. Baron says that if electricity prices were similar to 2013, when they were high in Alberta, combined with the lower cost of solar PV today and increased efficiency in installations, the economics would become extremely favourable for solar. Overall, Baron believes Solar PV generally is becoming much more competitive in price. “I think we’re transitioning from people who have solar PV because they like gadgetry or they like the environment and it’s a good thing to do.